There is probably no more iconic handgun silhouette in American history than that of the Colt Single Action Army. The Model 1873, known alternatively as the Model P, Peacemaker and by a variety of creative nicknames was the final result nearly a decade’s worth of effort by Colt to bring the next generation of handguns to the US military. The success of repeating, self-contained metallic cartridge firearms during the American Civil War, such as the Spencer Rifle & Carbine and the Henry Rifle had clearly foreshadowed the end of the age of percussion firearms. Almost from the moment the Civil War ended, the US Ordnance Department began looking for the next generation of cartridge firearms. 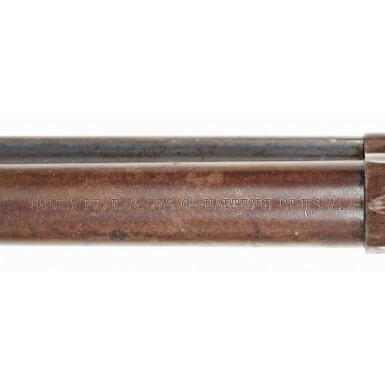 The development of a cartridge conversion system for the existing stock of single shot, muzzle-loading muskets by Springfield Master Armorer Erskine S. Allin solved the problem of cartridge long arms for the Army, and eventually leads to the manufacture of the “Trapdoor” series of arms. However, the solution for the handgun problem was more complicated. Smith & Wesson owned the rights to Rollin White’s “bored through cylinder” patent, making the production of conventional metallic cartridge revolver impossible without coming to some sort of royalty payment arrangement with Smith & Wesson. The patent would not expire until April of 1869, so until that point most firearms companies had their hands tied. In 1868, in order to get into the game a little quicker, Remington agreed to pay royalties for the right to use the bored through cylinder patent in the alteration of percussion Remington handguns to metallic cartridge. Remington submitted several cartridge conversion samples for the US military handgun trials in 1869. However, it was Smith & Wesson who received the first US military contract for a cartridge revolver design. In 1870 the US military ordered 1,000 Smith & Wesson Model No. 3 “1st Model” American Revolvers, chambered for the .44 S&W American cartridge. These guns with their top break design and automatic extraction would became the basis for the later M-1875 “Schofield” revolver. Colt was not out of the running, however, and Springfield Arsenal altered about 1,200 existing Colt M-1860 Army revolvers from percussion to .44 Colt via the Colt Richards Conversion system in early 1871. These proved satisfactory initially, but were still not as strong as the Remington Army revolvers, whose frames included a top strap for additional strength. During this time, Colt was working on what they were referring to as their “strap pistol” in house. This revolver included all of the best features from the Richards and Richards-Mason conversion, the Model 1871-72 “Open Top” and some new features like a frame with a top strap and a newly designed loading gate. In late 1872 this new revolver was submitted for trials to the US Ordnance Department, chambered in the .44 S&W Russian Cartridge. 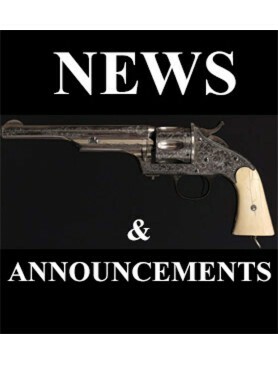 Colt assumed that since the .44 Russian was a superior cartridge to the .44 S&W American, that the Ordnance Department would prefer that chambering, but in reality they intended to test the new Colt against the Smith & Wesson M-1870, and since it was chambered for .44 S&W American, the Colt needed to be as well. After thorough testing by the US military, recommendations, and minor modifications and improvements, the new Colt Revolver was officially accepted for military service as the Colt M-1873 Revolver. The Colt M-1873 Revolver was a single action, 6 shot revolver with a 7 ““ barrel, chambered for the new .45 Colt cartridge. This new cartridge pushed a 250 grain, .454” diameter lead bullet at about 950 ft/s, with a muzzle energy of about 520 ft-lbs. The stopping power of this cartridge would become the gold standard of the 19th century and would be the benchmark for the .45 ACP cartridge, adopted in 1911, which is nearly the .45 Colt’s ballistic equivalent. The barrel of the revolver was rifled with 6 narrow grooves that made one turn in 16” a left hand twist. The gun had a solid frame with a topstrap, a hinged loading gate on the right side for loading and unloaded cartridges and a spring tensioned ejector rod mounted on the lower right side of the barrel. The revolvers were blued, with color case hardened frames and hammers. The one-piece walnut grips were oil finished. 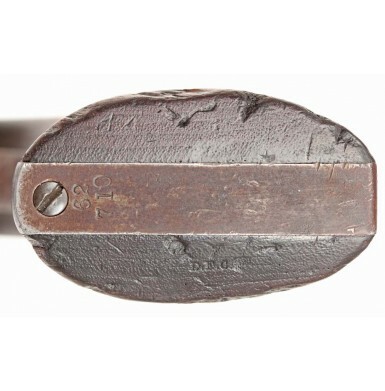 A screw entering from an angle at the bottom front of the frame retained the cylinder arbor pin, and this feature would become known to collectors as the “black powder frame”. 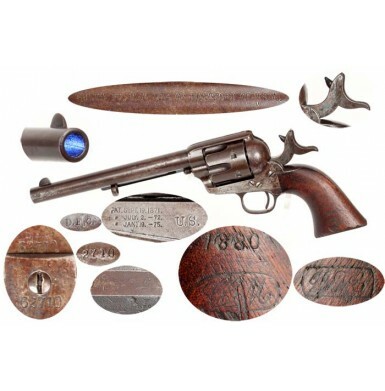 Even though these revolvers were manufactured with mostly interchangeable parts that would require little, if any, fitting to exchange between guns, they were inevitably serial numbered on all of their major components, just like their Civil War era, non-interchangeable brethren had been. These 7 ““ barreled US martially marked Single Actions have acquired the collector term “Cavalry Model” to differentiate them from other variants of the Single Action Army. Colt accepted the first contract, for 8,000 revolvers, on July 23, 1873 and deliveries began on September 2 of that year and ran through March of 1874. 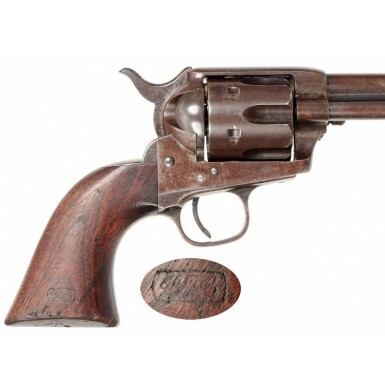 Over the next 16 years, some 37,060 Single Action Army revolvers would be purchased from Colt by the US military, with the final deliveries taking place in April of 1891. During this 16-year period a number of small changes took place on the revolvers, mostly affecting the style, placement and content of various marks. Some very minor cosmetic changes occurred during the transition from the 1st contract to the 2nd contract, such as increasing the bevel at the front of the cylinder, beveling the ejector housing tip, and increasing the size of the cylinder stops. These changes, however, are only really relevant when discussing the earliest guns delivered by Colt, as these features were standard by the time the 2nd contract was accepted. A US military sub-inspector and an accepting officer from the US Ordnance Department would inspect all of these military guns. The sub-inspectors were civilian employees of Springfield Arsenal, but the receiving officer was a US Army officer assigned to the Ordnance Department. Over the years, collectors have classified the Colt Cavalry Models by the name of the sub-inspector, whose initials appear on most of the major components of the revolvers and in a cartouche on the right side of the grips (with the exception of the Ainsworth cartouche that appears on the left side of the grip). The first group of 8,000 revolvers are the most prized Cavalry Models and are known by the their sub-inspector Orville W. Ainsworth. The guns from this first contract were inspected with small, single letter inspection marks, as they had been during the Civil War. This system was subsequently changed to the use of all three of the inspector’s initials to avoid confusion between Colt in-house inspection marks and military inspection marks. It was also confusing when an inspector with a last name that started with “C” (like A.P. Casey) used only one letter, as it could be confused for a condemnation mark, rather than an acceptance mark. In addition to requiring the use of a full set of sub-inspection initials, the old system of placing two cartouches on the guns returned, with the sub-inspector marking the right side of the grip and the accepting officer marking the left. The year of acceptance was also added above the accepting officer’s cartouche. The early inspection marking system is typically found on revolvers under serial number 19,500 and the improved system was in full force by about serial number 30,000 (although there are some exceptions in the 47,000-50,500 range “ See Graham, Kopec & Moore for more information). Other inspectors that are regularly used to identify Cavalry Single Action Revolvers are John T Cleveland (c1876-1877, serial number range 30,693-35,569), Henry Nettleton (c1878, serial number ranges 36,798-39,703 & 47,056-51,083), David F. Clark (c1880-1886, serial number ranges 41,033-43,300 & 53,006-121,238) and Rinaldo A. Carr (c1889-1891 serial number range 130,438-140,361). I am indebted to A Study of the Colt Single Action Army Revolver by Graham, Kopec & Moore for the detailed information regarding the years and serial number ranges for the various sub-inspectors who viewed these Colt revolvers. In all, the Ordnance Department would procure some 37,060 Colt Single Action Army Cavalry revolvers between 1873 and 1891. In 1895 a process or refurbishing and upgrading the revolvers in service began the process of creating what collectors have termed the “Artillery” Model revolvers. These were 7 ““ barreled cavalry revolvers that were refurbished, refinished and often had their barrels shortened to 5 ““ in length. The first revolvers to be so transformed were 2,000 that were returned to Colt between 1895 and 1896 for the full restorative treatment, and were returned good as new with 5 ““ barrels. It appears that most of these guns came back from Colt with their serial numbers matching. In 1898, some 14,900 of the guns were reconditioned at Springfield Arsenal, where they were reassembled without any effort to match components and serial numbers, and were returned to the field with 5 ““ barrels as well. Between 1901 and 1902 2,600 guns were returned to Colt for refurbishing, but these guns were noted to have already been altered to 5 “. It is probable that these were revolvers that had seen service during the Spanish-American War, either in Cuba or the Philippines, where the harsh climate had taken its toll on their condition. The final group of guns to recondition and shortened to 5 ““ were another 2,600 that were sent to Colt in 1903. In all at least 19,500 Colt Single Action Army “Cavalry” revolvers were altered from 7 ““ barrels to 5 ““ barrels between 1895 and 1903, which is slightly more than half of the total acquisition of this model by the Ordnance Department. This explains why it is rather difficult to find original, unaltered Cavalry Model revolvers today. Even though the M-1873 was officially replaced in 1892 by the M-1892 double action revolver in .38 Long Colt, the anemic stopping power of this cartridge meant that the M-1873 remained in limited use as a “substitute standard” handgun until the adoption of the Colt M-1911 .45 ACP semi-automatic pistol. The success and popularity of the Colt Single Action Army is probably only eclipsed by the success of the Colt M-1911. Slightly less than 358,000 Single Action Army revolvers, in all variants, were produced by Colt from 1872 through 1940, with production picking up again in 1955 with some 59,000+ produced before these “2nd Generation” guns went out of production in 1970. 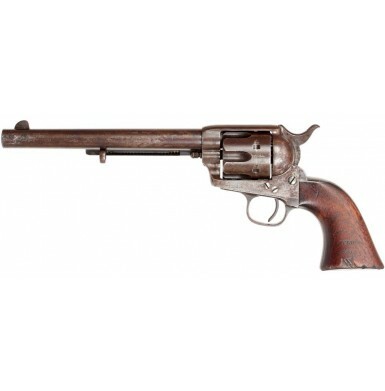 The Single Action Army remains a part of the Colt production line today, and has been copied by many gunmakers around the world, a testament to the success of the design and its overall popularity. However, no modern incarnation of the classic Colt revolver is as historic or collectible as the original 7 ““ “Cavalry” M-1873 Single Action Army, delivered to the Ordnance Department between 1873 and 1891. Offered here is a VERY GOOD+ example of a US Military 7 ““ “Cavalry” Model 1873 Single Action Army Revolver, inspected by David F. Clark. Clark inspected a total of 13,000 Single Action Army revolvers from 8 government different contracts during his 8-year tenure at Colt from 1880 to 1887. This gun is from the 2nd contract that Clark inspected and was part of an order of 1,000 revolvers placed by the Ordnance Department on October 20, 1880, which were subsequently delivered during December of the same year, with the last revolvers being accepted on December 31, 1880. As the arsenal sub-inspector assigned to the Colt factory during this time, Clark inspected every contract revolver in detail. As a result, this revolver bears his sub-inspection initials, D.F.C., on nearly every major component, along with his inspection cartouche on the right side of the grip. The revolver is 100% complete, correct and authentic, and is also accompanied by a letter from Single Action Army historian, researcher, and author John. A. Kopec, attesting to that fact. The revolver is serial number 62710 and even though most Colt serial number lists claim that 1881 production began with serial number 62,000, these are only rough estimates, and even Mr. Kopec notes that the revolver was manufactured and delivered in December of 1880. The complete, matching serial number 62710 appears on the triggerguard, frame, and bottom of the grip strap, with the abbreviated serial number 2710 (the last four digits) appearing on the side of the cylinder and on the barrel under the ejector housing, which must be removed to see it. The loading gate is assembly numbered 2551, and this number should not match the serial number of the gun. The bottom of the barrel, forward of the cylinder arbor pin is marked with the expected D.F.C. inspection mark and a P proof mark. The D.F.C. mark also appears on the bottom of the frame, above the serial number, on the side of the cylinder and on the bottom right side of the grip. The lower left side of the frame is marked with the correct 3-line patent date markings: PAT. SEPT 19. 1871 / “ JULY. 2. “ 72. / “ JAN. 19. “ 79. and with the military ownership and inspection mark U.S.. 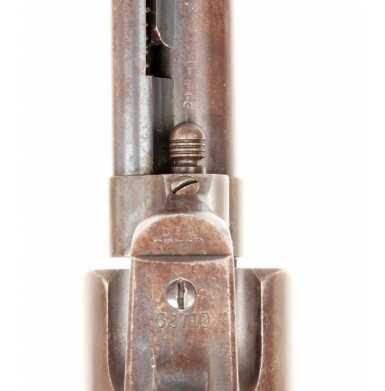 The barrel is marked with the 2nd type barrel address, found on revolvers with barrels 5 ““ long or longer, from about serial number 24,000 through the end of production in 1940. This block letter address reads in a single line: COLT’s PT. F. A. Co HARTFORD CT. U.S.A.. The right side of the grip retains a partially legible David F. Clark cartouche, with the script letters DFC surrounded by an oval outline. The left side of the grip shows a clear, script CCM cartouche in a rectangular box with rounded edges, with the date 1880 over it. This is the acceptance cartouche of US Ordnance Department receiving officer Lt. Charles M. Morrison, who inspected Colt revolvers with Clark from 1880-1882. All of the markings on the gun remain crisp, clear and fully legible, with the exception of the D.F.C. cartouche, which shows some minor wear as well as a slightly enhanced outline around the initials. The gun is in overall VERY GOOD+ condition and is a very crisp and pleasing example of an original 7 ““ Cavalry Single Action Army Revolver. The gun retains somewhere between traces and about 5% original blued finish, with the largest areas of original finish being on the ejector rod housing, along the barrel where the top of the housing and barrel meet, on the barrel under the housing, in the cylinder flutes and on the triggerguard. The gun has not been refinished at any point in time, and traces of the original “feathered” polish marks are present on either side of the front sight. The balance of the gun has a very attractive, untouched plum-brown patina that is mostly smooth, with some small areas of lightly scattered pinpricking and minor surface roughness and oxidation. These are primarily on the barrel just forward of the cylinder and at the muzzle. The frame is smooth and has a pleasing mottled brown and plum patina, with some tiny hints of case coloring in the protected areas and recesses of the frame. The hammer retains about 20% vivid case coloring, most of which is confined to the left side of the hammer where it has been protected by the frame. The right side of the hammer shows slightly less color in this same area. 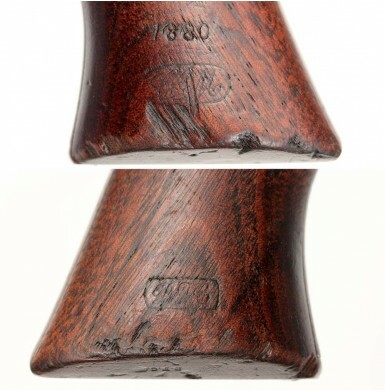 The balance of the hammer has the same smooth plum-brown patina as the rest of the gun. The trigger retains traces of blue, and has faded to dull blue-black patina. The screws all retain strong traces of their soft niter blued finish, and have a pale blue patina, when compared to the balance of the gun. The screw heads are mostly in very nice condition with only one frame screw showing any significant slot wear and the balance showing only very minor wear. The original and correct bullseye ejector rod is in place on the revolver, along with the original front sight. The action of the revolver is EXCELLENT and the revolver functions crisply and correctly on all positions. The revolver times and locks up perfectly and remains exceptionally tight. The loading gate functions smoothly and locks tightly into place and the ejector rod operates smoothly as well. The bore of the revolver rates about VERY GOOD+ and has a dark, seasoned brown appearance. It retains crisp rifling and shows only scattered light pitting along its length. The original, oil finished, one-piece walnut grip is in about VERY GOOD condition as well. As noted above the grip retains two good inspection cartouches, as well as an inspection date on the sides and clear sub-inspection mark on the bottom. The grip fits the frame perfectly and shows age, wear and patina that match the revolver perfectly. The grip is solid and free from any breaks, cracks or repairs. The grip does show several small chips missing, the worst of which is a series of about 3 small chips below the “CCM” cartouche on the left side. These chips are all worn smooth, suggesting they are from the period of use and quite old. The are some much smaller chips along the bottom sharp edges and leading edges of the grip as well, but nothing significant. The grips shows the usual bumps, dings and minor marks from service and use, as would be expected from a late-19th century military revolver. 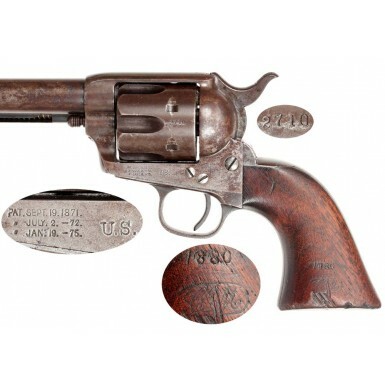 Overall this is a very crisp, well marked, and very attractive example of a 7 ““ Colt Single Action Army US Cavalry Revolver. The gun is 100% complete, correct and original and somehow appears to have escaped the refurbishment, rebuilding and barrel shortening that so many marital Single Action Revolvers were subjected to during the twilight of their service life. Untouched, well marked Cavalry Single Action Revolvers are very tough tot find these days, and when they are found they command strong premiums, and are often late production guns from the Rinaldo A. Carr era. This is a great Indian Wars era gun, accepted by David F. Clark in December of 1880, and in service for the last decade of serious Indian War service. Even though this gun was likely issued to a state militia, which allowed it to escape alteration to “Artillery” configuration, it was still in service during Apache Wars (c1880-1886), the Ghost Dance War (1890-91), the Pine Ridge Campaign (1890-91) and the Wounded Knee Massacre (December 29, 1890). Many martial single actions also saw use with volunteer regiments during the Spanish-American War. A letter of authentication from John A. Kopec also accompanies this crisp revolver. Kopec could find nothing incorrect about the gun, except that the oval outline around the DFC cartouche may have been enhanced. Rarely do you have the opportunity to acquire such a well-marked, complete and original US military Single Action Army in its original cavalry configuration, without spending at least 5-figures. 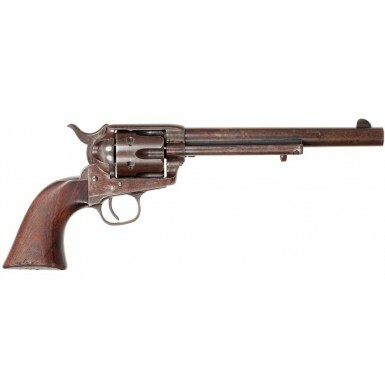 This is a gun that any serious collector would be proud to own and would be a fabulous addition to any collection of US cavalry revolvers from the Indian War era.